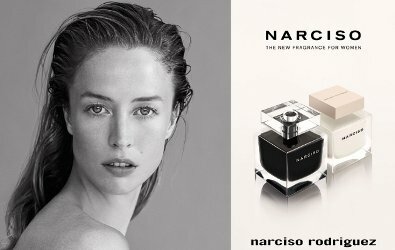 There was plenty to like about Narciso by Narciso Rodriguez, which launched as an Eau de Parfum in 2014. The white cube bottle was perfect, and perfumer Aurélien Guichard's composition, which I likened to "a very thin schmear of gardenia marshmallow fluff on a wood plank", struck a nice balance between wearable and fun. I'm no longer in buying mode, but I would not at all mind having a small bottle. The new Eau de Toilette is clearly related to the Eau de Parfum, but as you'd expect, it inches farther along the line towards wearable. The opening is still "raspy, citrus + dry herbs + plant stems + fruit" but it's more transparent now, and the dry down replaces the gardenia of the Eau de Parfum with what they call a "delicate combination of peony and Bulgarian rose" and what I would call "generic pink perfume flowers". The base is likewise lighter and paler: less powder and vanilla, less wood and vetiver, a cleaner rendition of musk. Verdict: Narciso Eau de Toilette smells younger and fresher than the Eau de Parfum. It probably works better for warm-weather wear, and will be undoubtedly easier to wear to the office. I did not find it objectionable to wear, but nor did I find it fun, or interesting, or memorable. Wearing the two versions together mostly served to remind me how good the Eau de Parfum is. The reviews I've seen so far have been overwhelmingly positive, though, so the Eau de Toilette is certainly worth a try, especially for anyone who found the Eau de Parfum too much. Narciso by Narciso Rodriguez Eau de Toilette is available in 30, 50 and 90 ml. Thank You for this review. I unexpectedly love the edp. I needed to know the difference in the edt before I decided to purchase the edp or not. The edt doesn’t sound very interesting. Thanks again. I am in exactly the same position – I sampled the EDP and like it very much, but didn’t want to put it on my “to buy” list until I knew more about the EDT (after all, many people (including me) prefer the EDT version of NR “For Her”). So thank you, Robin, for providing your expert comparison of “Narciso”. I think the EDP will work particularly well in cooler weather, so its moving toward the top of my list. I’ve really been wanting the edp. I am holding off in hopes that thet might put it out in a holiday gift set. Did they not do one in 2014? If they did, I didn’t know because I have only recently smelled it. I do think they should have stuck with the gardenia and made it lighter. I obviously know zilch about fragrance marketing, but also seems to me that it’s confusing to consumers, who after all are already overwhelmed with choice, to make EdTs and EdPs so different. The number of people who are really paying attention to marketing messages must be so small to begin with. It might depend on your opinion of peony in perfume. I nearly always find peony meh. Would love to have a little travel spray of the EdP. Robin, do you think the edp drydown is similar to aromatics elixer? Or am I hallucinating it? I have spent so little time with AE (and so long ago) that I could not say, sorry! Remember AE as having a much darker and heavier base, with way more patchouli, but I can’t really remember the “smell”. But can imagine that the camphorous edge to the gardenia in the N EdP might also translate similarly to old-style “real” patchouli that they must have originally used in AE. Yeah although the EDP is closer to said list than it should be! I like this until I noticed a note that reminded me of cheap hot chocolate mix powder. I’ll try the EdP if I come across it. Really?? I would have liked it better if I’d smelled that! LOL, Robin, I thought of the artificial cocoa note as a negative, but I guess I didn’t think through how boring the generic pink perfume flowers and clean musk would smell without it. Like a lot of people here, I liked the EDP . I found it quite abstract and abstract scents are my fave really. No doubt one day I will buy a small bottle too. I have not tested the EDT but I love the new bottles. Perfect. I love the bottles too. The colors seem reversed to me, but no matter. Agreed…. I find it kinda ironic that the EDT is in a black bottle, while the EDP is in a white one. Although consistent as the ‘For Her’ EDT is a black bottle and the EDP pink. 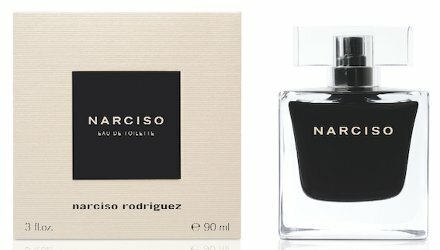 Narciso EdP smells to me like an intense version of Dior’s Gris Montaigne so maybe something to look into if one is looking for a milder version. Thanks, have not tried that one! Thank for for this review, Robin. I currently work as a photographer for a cosmetics and perfume distributor, and recently smelled Narciso EDT as work. Found it pleasant enough, though not nearly as beautiful as the EDP. Narciso EDP is probably the perfume I get the most complements on when I wear it…. which is wonderful. “Pleasant enough” is right — it’s still better than lots of other perfumes on the market, and I’d be less picky if the EdP wasn’t so good! I ADORE the EDP. In fact, if I could only keep one perfume in my collection, it would be that one. I did buy the EDT on the strength of the original, but it’s not quite as interesting. Still, nice enough for daily wear. Curious then if you’ve tried any of the body products? I’m thinking of the cream or lotion especially. Yeah, both of them. The cream is better than the lotion but they both work well as a base for the EDP. As expected, they don’t do much alone. I just received a bottle of this as a gift from a friend. On my skin, I find it to be very similar to Piguet’s Calypso reformulation (although I have not tried them side-by-side). The fact that Aurelien created both makes sense. I haven’t tried the EDP, but the EDT, to my nose, is quite intense and wintery and will probably be something I only wear for “special occasions,” like my bottles Coco and Black Orchid Voile de Fleur. Sadly, there aren’t enough special occasions, but I think I’d kill my coworkers with any of the above. The only Peony dominant fragrance I have is Qeuel Amour! I’m sixty, with a big perfumed past, so if it is ‘meh’ to the general populace I’m out of step. Like Elena of Perfume Shrine I’ve fallen for this one. Can’t help myself, bad habits.